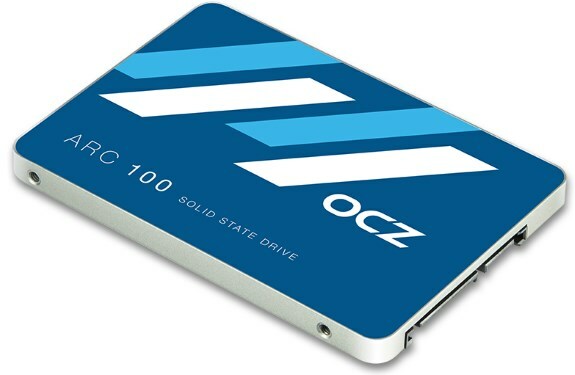 OCZ introduces the ARC 100, a new SATA 6Gbps SSD that features the Barefoot 3 M10 controller and Toshiba A19nm NAND flash memory. The ARC 100 is available in 120GB, 240GB and 480GB capacities for $74.99, $119.99, and $239.99, respectively. The ARC 100 doesn't promise top-of-the-line performance but with transfer speeds rated at up to 490MB/s and up to 80,000 random 4k write IOPS it still packs quite a punch. ARC 100 SSDs feature next generation Toshiba A19nm NAND flash, delivering a value-oriented option for users looking to upgrade their storage to a faster or higher capacity solution without the steeper price points commonly associated with high performance SSDs. Utilizing the proven Barefoot 3 M10 controller that emphasizes real-world performance, ARC 100 SSDs deliver excellent sustained and mixed-workload speeds for a more responsive and enjoyable computing experience, while delivering up to 490 MB/s sequential bandwidth, and up to 80,000 4K random write IOPS. With an emphasis on reliability and endurance, ARC 100 SSDs are rated to deliver 20GB of host writes per day under a 3-year warranty period, and feature an advanced suite of flash management tools that analyze and dynamically adapt to increasing NAND vulnerabilities as flash cells wear, heightening data integrity and longevity over the long term. All ARC 100 SSDs are engineered and tested to ensure superior quality, reliability, and compatibility and also come backed with OCZ’s brand new “ShieldPlus Warranty”, an industry-leading approach to service that eliminates all the hassle surrounding support and warranty claims consumers often have to deal with. With no original proof of purchase required, end-users simply provide their ARC serial number and a dedicated OCZ customer service representative will provide high-caliber troubleshooting and support. In the event that the product is determined to be defective, a brand-new ARC SSD of the same capacity will be advance shipped to the customer. When the replacement is received, end-users will find a pre-paid return label and need only to place their original drive in the box for a free return to OCZ. With the value added ShieldPlus Warranty there is no support hassle, no endless return loops, no shipping costs, and end-users will benefit from significantly reduced downtime to maximize their SSD experience and productivity. OCZ ShieldPlus is available in both North America and EMEA at time of launch, and additional supported regions will be announced in the future. With the security of the ARC’s ShieldPlus Warranty, OCZ’s valued customers will have the peace of mind that they not only have a quality solid state drive, but also the very best service and support should they ever require it. The ARC 100 Series will be available through OCZ’s global channel in the next few weeks in 120GB, 240GB, and 480GB capacities, with a sub-7mm height alloy housing to support today’s thinner form factor notebooks.